Sassafras is a really neat tree and is easily identifiable because of its distinct feature that every tree has 3 distinctly different leaves. 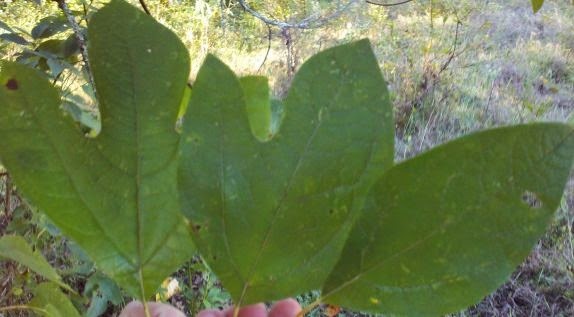 The three distinct leaves of the Sassafras tree. Sassafras has long been known as a medicinal herb used by American Indians for hundreds of years. The leaves, roots and oils of the Sassafras can all be used for a variety of conditions. Today, I am going to cover one way we harvest and use the Sassafras leaves. We turn them to powder and use it as many people do in Creole cooking. When Sassafras leaves are dried and ground up into powder, it is called file' or gumbo file' which is a thickener for soups and gumbos and to add flavor to them. It adds a bit of a spicy flavor. Just add it in once you begin to simmer your soup or gumbo. It is best not to boil it but let the flavors emerge from simmering. To make the powder, just gather up a few handfuls of leaves and rinse them off. 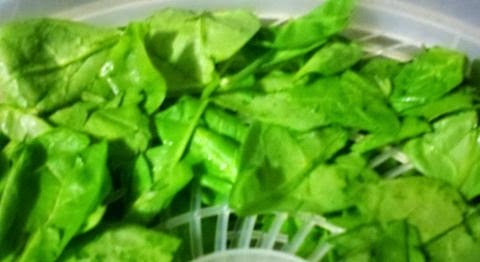 Pat dry and lay them on them on your dehydrator trays. Turn on the dehydrator and let the leaves dehydrate for about 4 hours. Once they are dry, they crumble very easily. Place them in a food processor or use a Magic Bullet (like I do) and pulse the leaves until they turn into a fine powder. 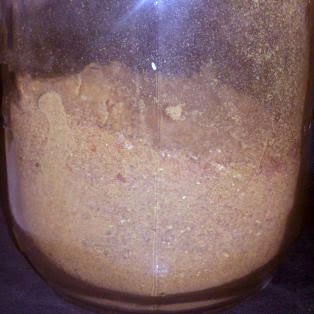 Pour into a mason jar and store the Sassafras powder until you are ready to use it. Check out my Jambalaya Recipe too! I love the color of the powder, don't you? 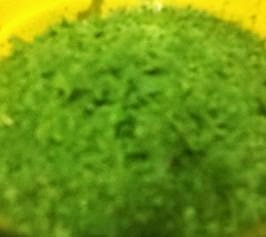 To make spinach powder is quite easy. 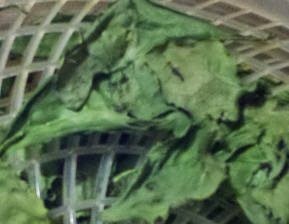 First, rinse off your spinach leaves and lay the leaves on your dehydrator trays. Turn on your dehydrator and let the leaves dry for about 4-5 hours. They are done when the leaves are brittle. 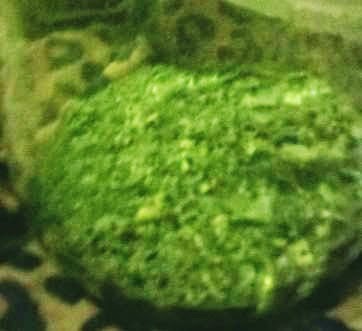 Take the dried leaves and place them in your Magic Bullet or a blender and pulse until it turns into a fine powder. You may have to strain the pieces through a sieve a few times to make sure the leaves are all ground up. Store your powder in a mason jar. When you want to use it, just add a tablespoon or two to your dish to add nutritional value, taste and color. I also dehydrate lettuce and collard greens! I love using my crock pot. Okay, let's be honest, I have two crock pots and I use them all the time, often both at the same time. Cooking meals in a crock pot just makes sense. Very little prep work; you don't heat up your house; you can put food on when you go to bed and it is ready for lunch the next day; or better yet, put a meal in the crock pot in the morning before work and come home to supper waiting on you. Meals in crockpots do not have to be elaborate. Because the food slow cooks all day (or night) the flavors have a chance to "meld" together and comes out fantastic. This is one of those meals. Place your potatoes into the crockpot. 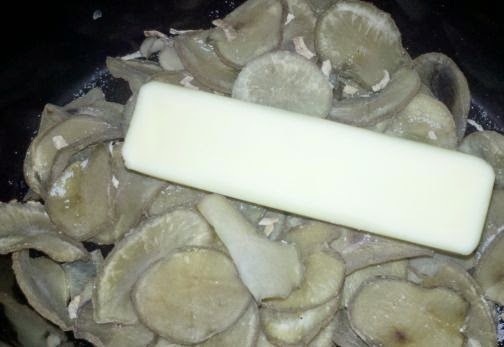 Put the stick of margarine on top of the potatoes. As you can tell, I used some of my dehydrated potatoes instead. If you use them, you do not need to soak them first. Put them in and they will soften and cook perfectly this way. 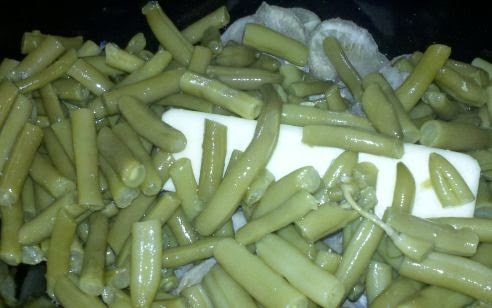 Drain the green beans and pour onto the potatoes. Pour enough water in the pot to cover the potatoes. 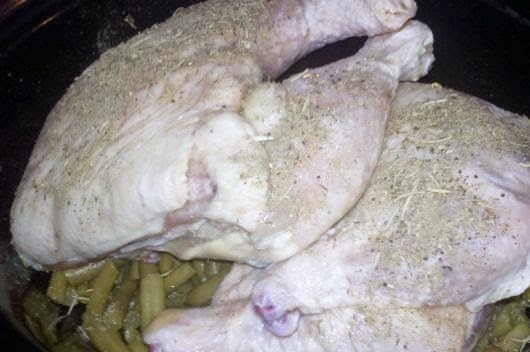 Place the chicken quarters in last and season them with a bit of poultry seasoning; put the lid on the crock pot and turn it on low. Let it cook 8 hours or overnight. I have let it cook up to 14 hours and it was still perfect. Other good Crock Pot recipes I have shared include: Orange Chicken and Swiss Steak in the Crock Pot! We love growing tomatoes in our garden. Tomatoes are one of the easiest things to grow, at least around here, and we always harvest so many of them. I can a lot of them and I also make spaghetti sauce and extra hot salsa. We eat fresh tomatoes with meals but there are still plenty left over. 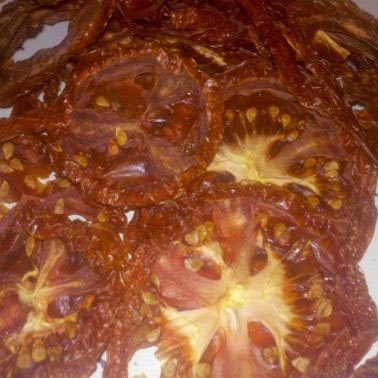 This year, I decided to make Sun Dried Tomatoes to help preserve them so we have tomatoes through out the year. They turned out beautifully. I also decided to make up some tomato powder. Tomato powder is pretty expensive to buy. It runs about $8.00-$15.00 a pound but you can make it for free with your excess tomatoes. If you have never used tomato powder, you are missing out. Tomato powder really adds a lot of flavor to soups, stews, casseroles, etc. If you need to add tomato paste or tomato sauce to a recipe, you can reconstitute the tomato powder and make your own paste or sauce. If you need tomato paste, just add 1-2 parts water to 1 part paste. For tomato sauce, use four parts water to one part tomato powder. One of the best things about tomato powder is it is a great way to preserve tomatoes, the nutritional value does not diminish and just a heaping tablespoon of tomato powder equals about a pint of fresh tomatoes (when it comes to adding taste and flavor to a dish). Take fresh from the garden tomatoes or tomatoes you have purchased. Cut off the ends of the tomato and using a sharp knife or mandolin, slice your tomatoes. I like to slice my tomatoes fairly thick. I found a bit thicker cut the tomatoes, the easier they are to remove off the trays. If they are cut real thin, they have a tendency to stick to the tray. I never spray my trays with cooking spray or oil because oil causes the fruit or vegetable to turn rancid. Lay your sliced tomatoes onto your dehydrator tray. 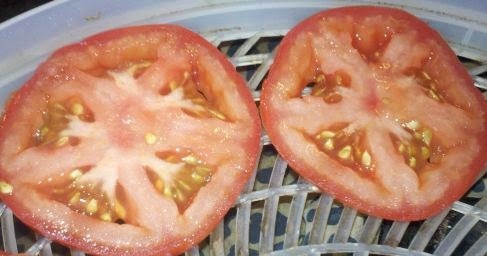 Turn on your dehydrator and let the tomatoes dry until they are brittle and no moisture remains (anywhere from 12-18 hours). Now take the dried tomatoes and place in your Magic Bullet or spice grinder. Turn it on and "pulse" the tomatoes until they turn into a fine powder. Store in a mason jar. Kept in your pantry, they have a shelf life up to 15 years. It really is amazing how it turns plain vegetables into culinary spirals. 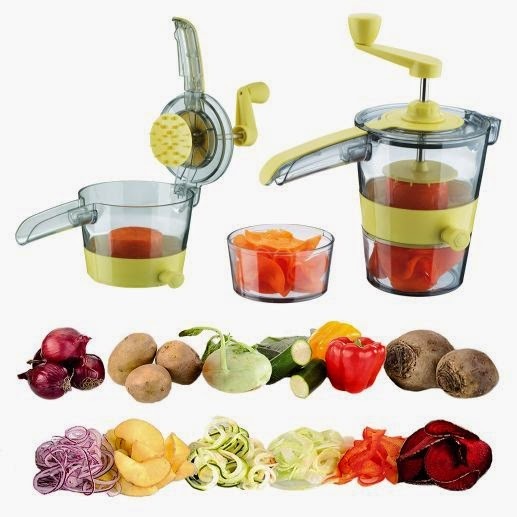 There are 4 different cutting widths and the handle is very easy to turn.